U.N. designations such as "World Heritage Site" and "Biosphere Reserve" are being placed on dozens of U.S parks and monuments, including Independence Hall, the Statue of Liberty and Yellowstone National Park. At Mt. 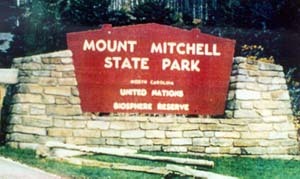 Mitchell State Park in North Carolina (pictured here), a sign leading into the park designated it as a U.N. Biosphere Reserve. When citizens protested, the words "United Nations" were taken off the sign and "international" was put in its place, to make it seem less ominous. But if all of this is so innocent, why were the words "United Nations" taken off? 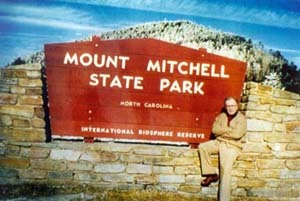 Is it not possible for federal and U.N. officials to explain the role of the U.N. in these parks and sites? Some experts believe that these international designations are part of a process by which the U.N., working with federal agencies, is moving to restrict access to enormous areas of U.S. territory, for the purpose of safeguarding the natural resources, including plants, animals and things, that are the province of "Gaia," the earth spirit. Not only do "some experts believe it", it is actually quite true. It's called "AGENDA 21". It is the United Nations blueprint for "Sustainable Development" and it mandates that all humans be caged into communities with NO ACCESS to nature, and ZERO private property rights. In other words, to "protect" the environment, your travel will be restricted and your ability to own land will be prohibited. Under Agenda 21, humans will have to change every aspect of their lives -- right down to the food you put into your mouth and the amount of water that you use. Humans will be forced to live in cramped "sustainable" communities where everything you need is within approx. a five-mile radius. Travel will be eliminated, and every part of your life will be heavily regulated. "Effective execution of Agenda 21 will require a profound reorientation of all human society, unlike anything the world has ever experienced  a major shift in the priorities of both governments and individuals and an unprecedented redeployment of human and financial resources. This shift will demand that a concern for the environmental consequences of every human action be integrated into individual and collective decision-making at every level. There are specific actions which are intended to be undertaken by multinational corporations and entrepreneurs, by financial institutions and individual investors, by high-tech companies and indigenous people, by workers and labor unions, by farmers and consumers, by students and schools, by governments and legislators, by scientists, by women, by children  in short, by every person on Earth." Agenda 21 is being implemented locally in cities all across America and around the world. Everyone should read and research it, then get active locally to fight its implementation in your city. Some common names for A21 programs are "Sustainable Development", "Smart Growth", "New Urbanism", "Communitarianism", "Scenic Byways", and "curtailing urban sprawl" -- a perjorative for keeping humans out of the rural areas because they argue that we are screwing up nature. This is by no means a comprehensive list of names! Indeed, the names of the UN programs are different from town to town, city to city. This is intentional to keep people from recognizing these programs in their towns. Therefore, everyone must familiarize themselves with the elements of Agenda 21. Even though the names are as numerous as the sands on the seashore, they all amount to the same agenda -- to forcefully remove you from your land and to control everything you do. Rest assurred that your town is targeted for UN Agenda 21 and it is likely being implemented right now. The only solution is to get educated and begin to get active on a state and local level in your government and to educate your neighbors about these dangers. The only way to counter it is the way it's being implemented: "Think globally; ACT LOCALLY." You have everything to gain and nothing to lose -- especially if you have children.